Sunday, August 9 1908 -- A minor Herriman cartoon for a minor news story. The Elks are holding a banquet in honor of some visiting members from Dallas Texas. The new story goes on for practically a whole column of type, but I will not bore you with all the details. (Okay, to be honest, I couldn't be bothered to read the story myself). Connie, February 21 1937, courtesy of Cole Johnson. So contemplate the casual way Dr. Chrono "in his spare time" while in a futuristic setting and helping defeat a terrible menance whips up a new time machine. Yikes! Love the intersting sci-fi setting. 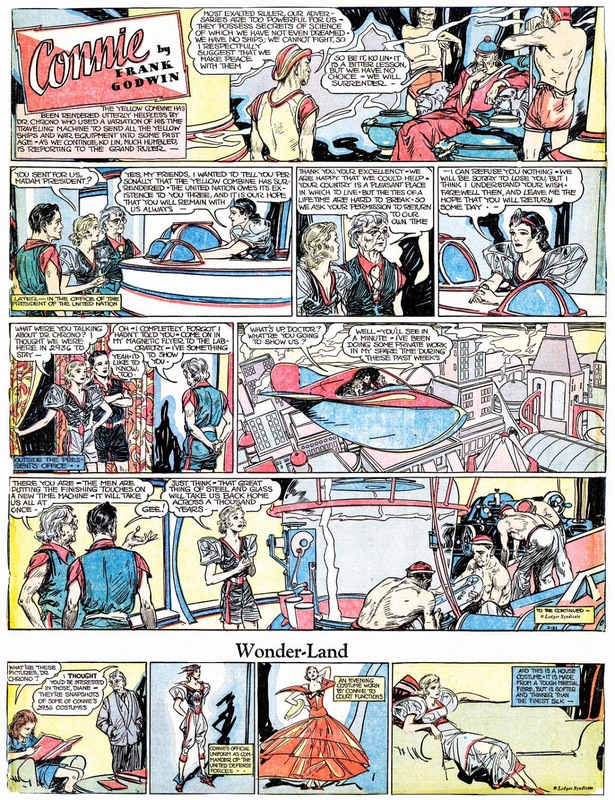 This is visually to my inexpert eye as wonderful as Raymond's work on Flash Gordon. On day two of our look at Jack Welch, we cover his one and only known daily newspaper series, On Our Block. 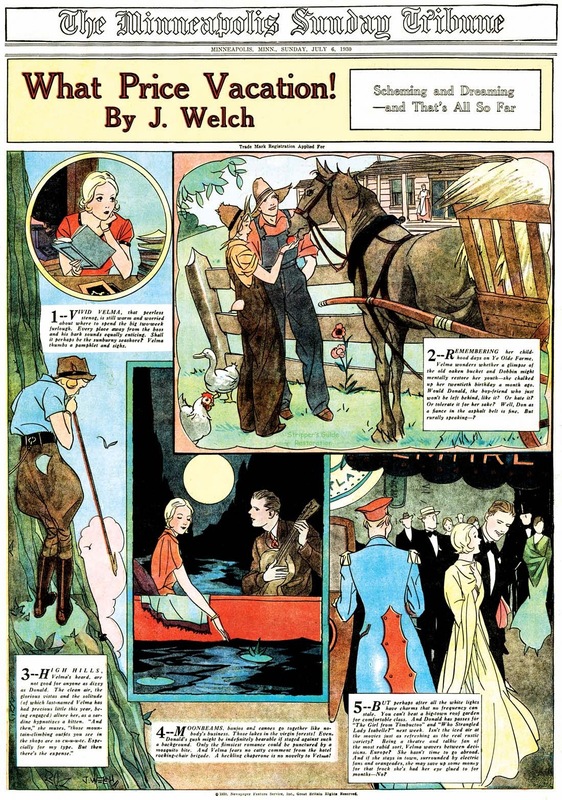 In his later advertising and illustration work, Welch was well-known for his depictions of children, so it is fitting that he did a panel on just that subject when King Features offered him a berth. The series was, in my opinion, delightful, but it failed to catch on. Welch's kids are a realistic blend of sinner and saint, and his settings run the gamut from the country to suburbia to the inner-city. Excellent cartoons that may have been unreasonably ignored due to the lack of focus. It is really hard to sell a panel series with no continuing characters. On Our Block started sometime in 1937 (known to be running by August), and seems to have been cancelled on February 5 1938. Not to be confused with the earlier Tom McNamara crudity. Magazine Cover Comics: What Price Vacation! Jack Welch would later be known primarily as a specialist in advertising art, but in the 1930s he dabbled in cartooning. 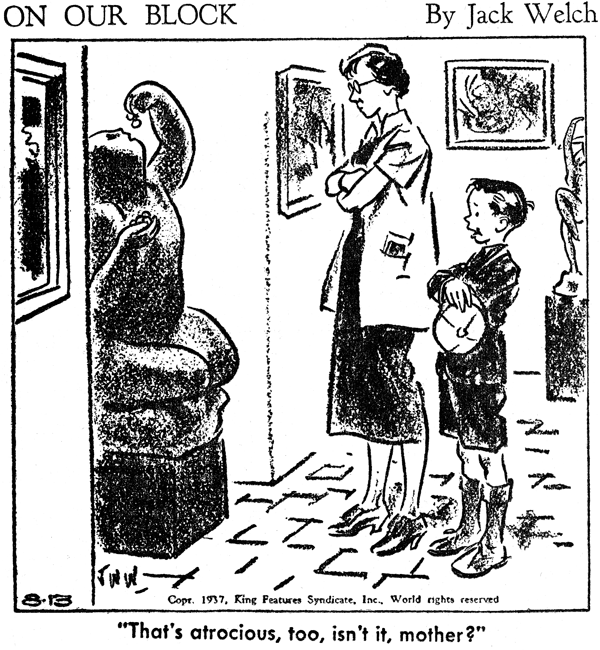 He did a short-lived panel cartoon (which we'll cover tomorrow), and his only other known credit is for What Price Vacation, a short-run Sunday magazine cover series. Unlike the typical series of this sort, there really isn't much of a plot; we just follow along with Vivid Velma's daydreams regarding vacation spots. The Newspaper Feature Service series ran from June 29 to July 20 1930, a mere four installments, which appeared on magazine covers while the folks reading Sunday papers were trying to figure out their own vacation plans. Morris “Mo” or “Moe” Leff was born in New York, New York on January 19, 1912, according to a family tree at Ancestry.com. In the 1920 U.S. Federal Census, Leff was the second of five children born to Benjamin, a baker, and Sarah, both Austrian emigrants. The family lived in Manhattan at 517 East 12th Street. The 1925 New York State Census recorded a sixth Leff child and the family’s address as 194 East 3rd Street, Manhattan. Information about Leff’s education and art training has not been found. 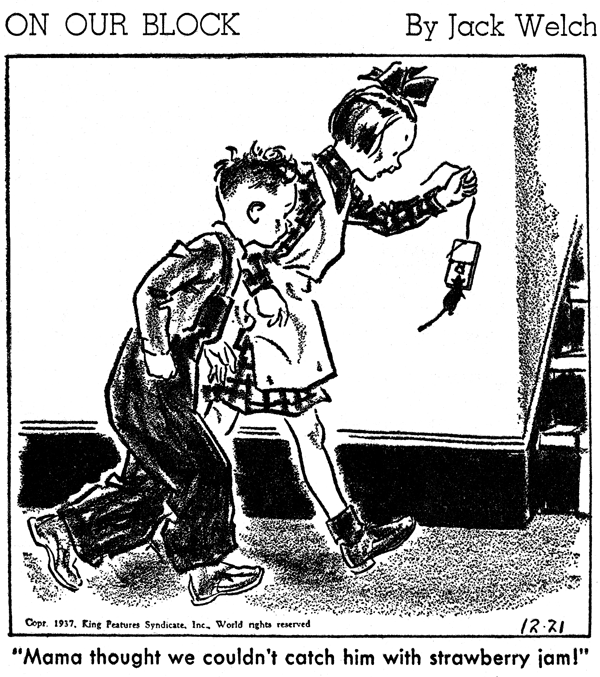 Perhaps Leff’s earliest work was in the tenth issue of the Dell comic book, The Funnies, which was published September 1929 and featured Eveready Eddie. 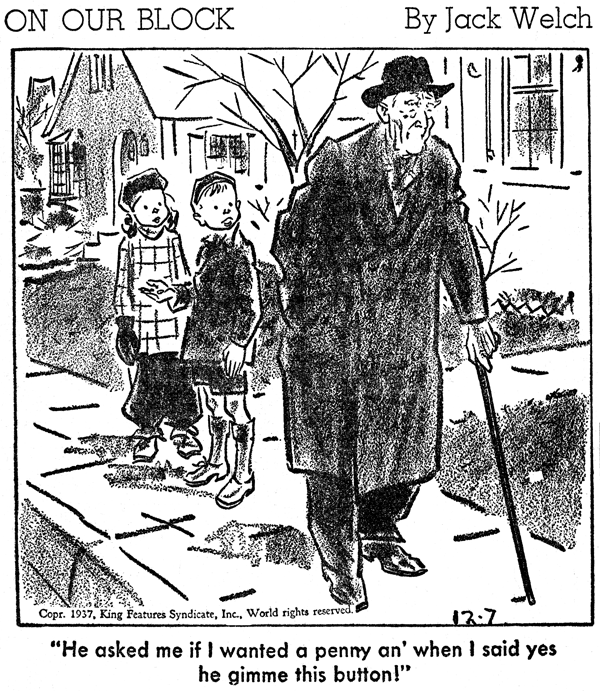 At age 18, Leff was a newspaper cartoonist according to the 1930 census. 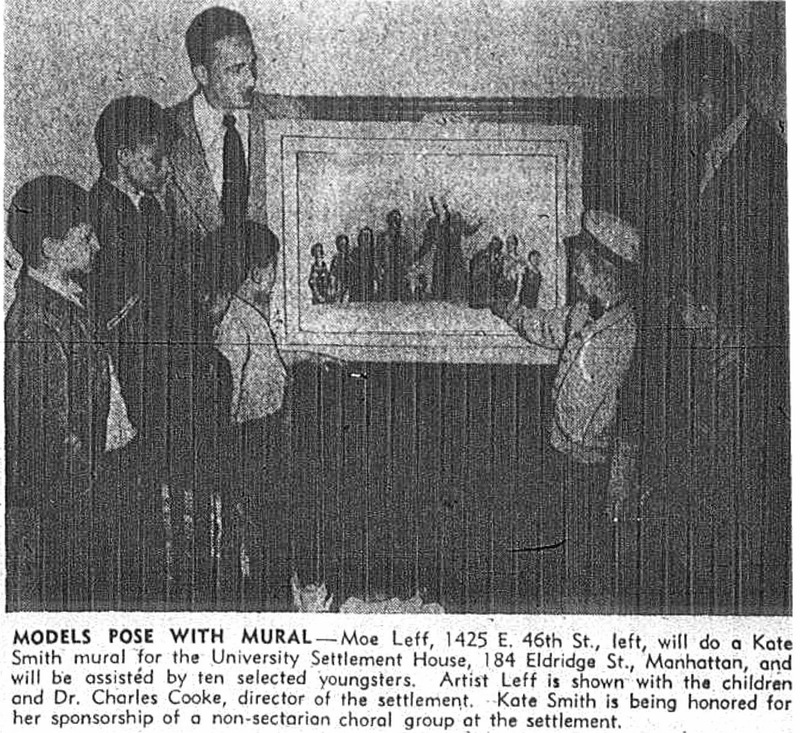 He lived with his parents and siblings at 625 East 5th Street in Manhattan. 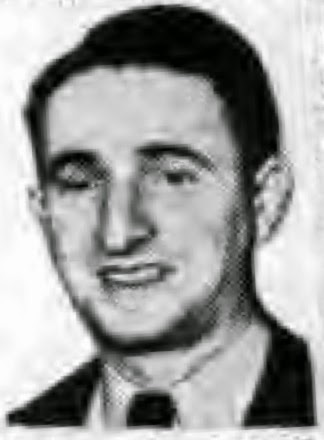 Leff’s younger brother, Samuel (1916–1981), would follow in his footsteps. 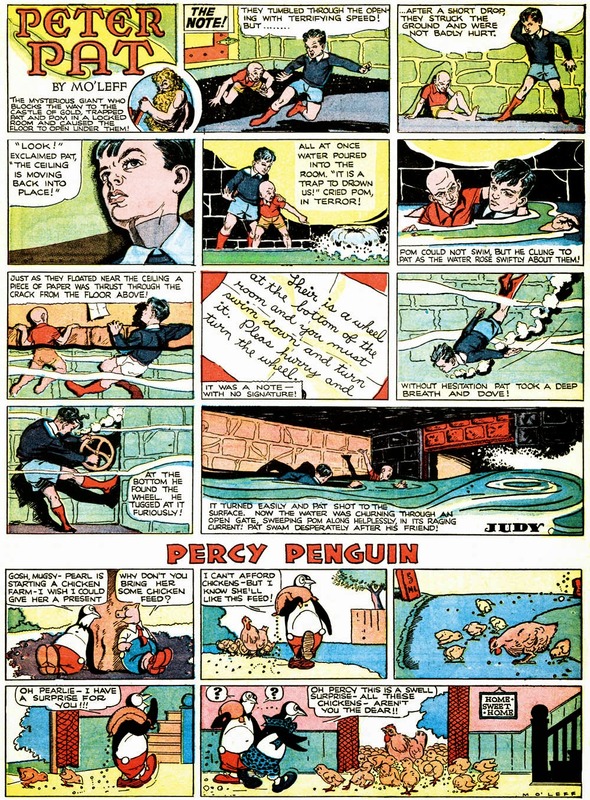 Who’s Who of American Comic Books 1928–1999 says Leff was on staff at United Feature Syndicate, which distributed his Peter Pat from June 3, 1934 to July 28, 1935. (Some of the art was collected and published in France by Hachette in 1937.) In 1936 Leff ghosted Li’l Abner and Joe Jinks. In the late 1930s, Leff assisted Ham Fisher on Joe Palooka. Question: Do you think that union boycotts should be outlawed as suggested in the Case Labor Bill? 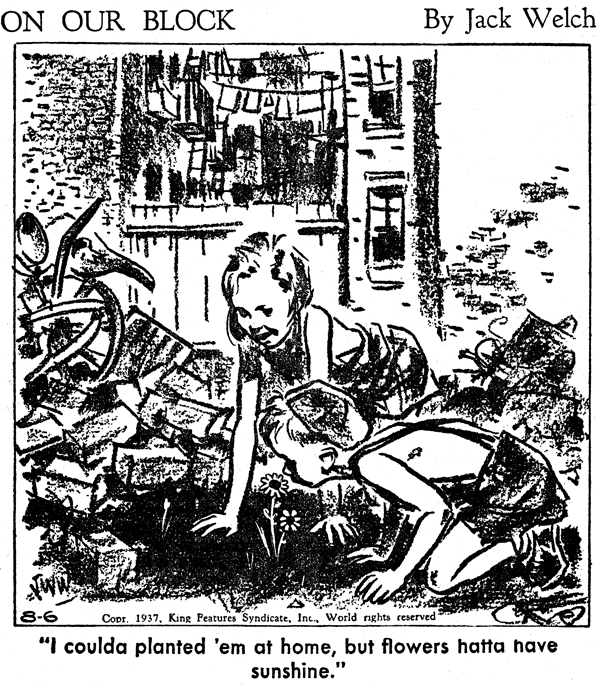 Moe Leff, Illustrator, E. 46th St., Brooklyn—It would be very unfair to have legislation of that sort. There would be too many loopholes for chiseling employers to take advantage of. In mass boycott unions make known to the uninformed public their grievances—which are just in most instances. Wilkes-Barre, Pa., April 18—(AP)—A section of Wilkes-Barre mountain will be dedicated this afternoon as Mt. Palooka to honer Ham Fisher, native Wilkes-Barrean and creator of Joe Palooka of comic strip fame. The program is scheduled for 2:15, following a luncheon for approximately 30 dignitaries at Hotel Sterling. With Fisher here for the ceremony are Moe Leff, an associate of the cartoonist; Joe Kirkwood, Jr., actor who plays the role of Palooka in the movies; Charles McAdams, president of McNaught Syndicate; and Humphrey, the fat boxing champion of Palooka in the comic strip…. Ham Fisher, creator of the popular comic strip hero, Joe Palooka, was found dead last night in a friend’s studio. Nearby were two notes indicting suicide police reported. Fisher, 54, whose full name was Hammond Edward Fisher, wrote in the notes of failing eyesight and a diabetic condition. He said that he had swallowed some pills. “My sight has gone to a great extent, is getting progressively worse, and my health has gone with it,” he penciled in one of the notes. The body was discovered about 9 p. m. in the studio of Moe Leff, where Fisher had been working lately during his friend’s absence from town. The discovery was made by another friend, Morris Weiss of Englewood, N. J, whom Fisher’s wife, Marilyn, had called after becoming alarmed over not hearing from her husband…. …Charles McAdam Jr. son of the president of the McNaught Syndicate, said the Joe Palooka comic strip will be continued by other cartoonists. Moe Leff and Phil Boyle, both of whom have worked with Fisher for about 20 years, probably will get the assignment, he said…. In 1959, Leff and Phil Boyle sued the estate of Ham Fisher and McNaught Syndicate over money and ownership of Joe Palooka. According to American Newspaper Comics, Tony DiPreta took over the strip September 7, 1959. Moe Leff, a friend, brother also of our longtime colleague Phil Leff, an editor at the San Francisco Examiner, died here in N.Y. much too soon at 56. Wow, Leff ghosted Lil Abner and then went on to work for Fisher. Im sure there is quite a story hidden there. 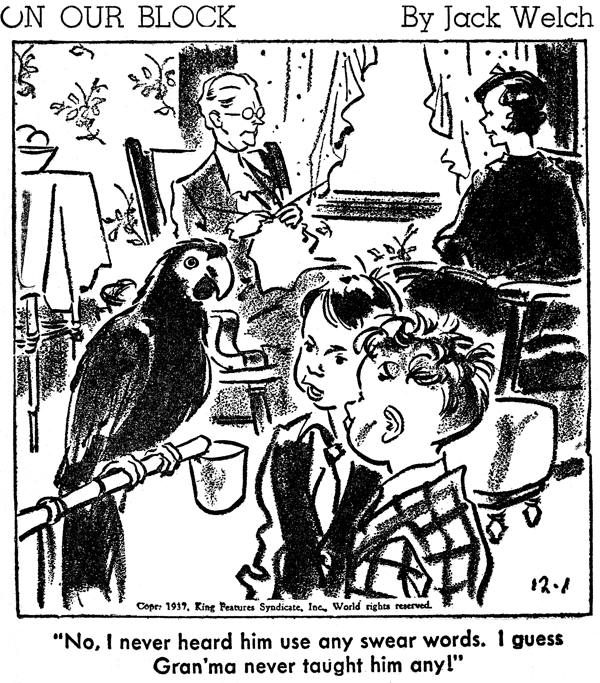 Mo Leff was one terrific cartoonist on Joe Palooka. 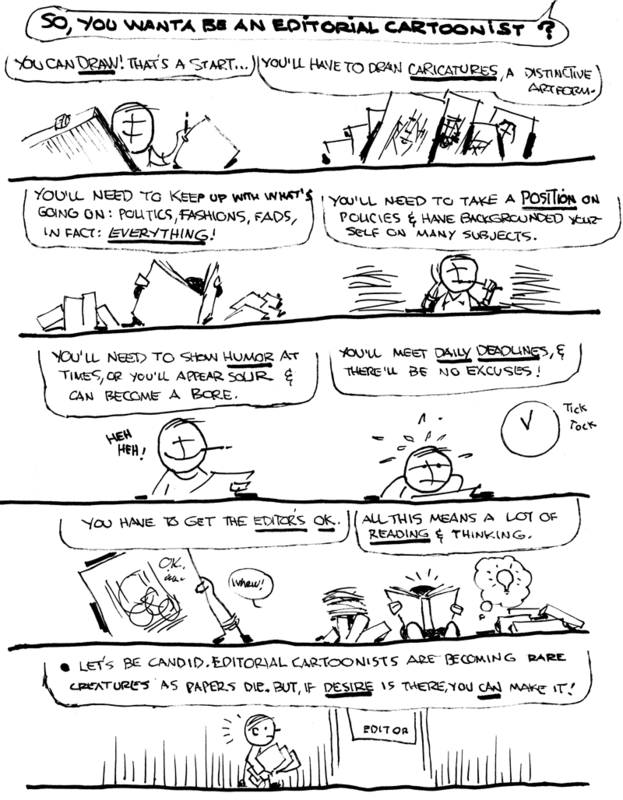 I just loved how he drew the cast of that comic strip. Such a very good storyteller. The varied emotions and his characters while cartoony really were dynamic. It's no wonder that as a little boy in Sydney Australia that I loved the comic strips and Harvey comic books. I'd like to know more about this man and his times of working on Lil Abner and Joe Palooka and what he drew once he left the Joe Palooka comic strip. ...The Kickerbpcker latr changed ots name to The New York Column. It ran to 1974 or so. It was, really, an attempt to provide an NYC home to many of the strips and features left without an NYC berth. when NYC went from 6?? 7?? Sunday newspapers at the beginning of the 60s to 2 by 1968. ...My family would sometimes buy it as an additional Sinday newspaper, but my father would refer tp it as " really, a glorified cpmics section " (It might have been more ambitios at the veru begonning.). I remember it as being tabloid-sized. Yes, pbviously, this was long after Moe Leff's departure frpm JP! ...Anyway,late in its life it changed its name to The New York Comics and reduced its npn- comics comtent to four pages, mostly?? puzzles. Its " glorified comocs section " nature prpbably meant that few libraroes preserved it..
...Write me at wllilly1960@gmail.com if ypu want tp talk aboit this more ( My name is Walter.). 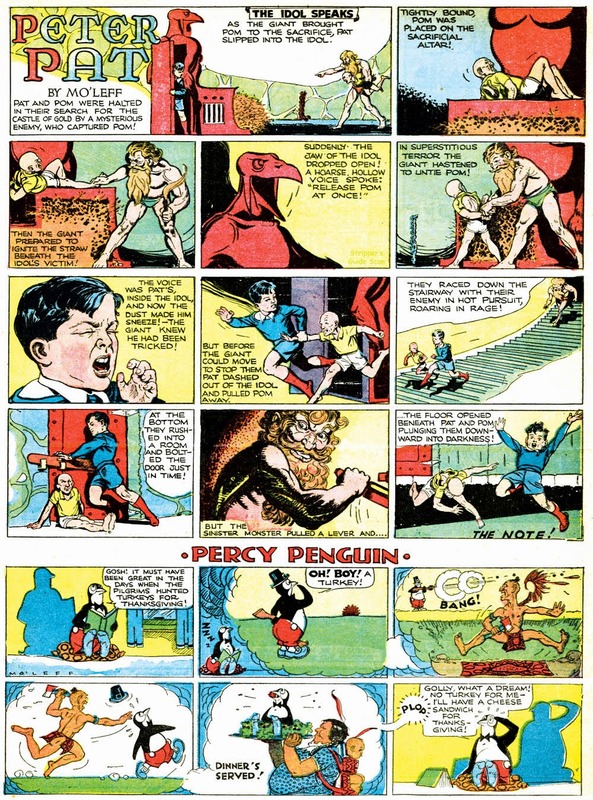 The 1930s were the golden age of the adventure strip, and with so many new strips vying for the attention of newspaper editors and readers, it is inevitable that some worthy ones fell through the cracks. That, I think, was the fate of Mo Leff's Peter Pat. Created by Leff for United Feature Syndicate shortly before he switched to a long career as an assistant/ghost for others, this strip is really our only opportunity to see where Mo's own creative impulses would lead him. And wow, what a creative mind he had. Peter Pat reads like a combination of J.R.R. Tolkein, wacky 1930s cliffhanger radio and movie serials, and Dungeons and Dragons-type role-playing games. Leff is so brimming with creativity that he can't seem to cram enough adventure onto each page to suit himself, and we readers have to hang on tight for the thrill ride. The protagonists are Peter Pat, a kid who looks more like a miniaturized adult, and his pal Pom, who looks like an even more miniaturized senior with the legs of an athlete. They go on a breakneck adventure through fantasy land that unfortunately didn't last long. 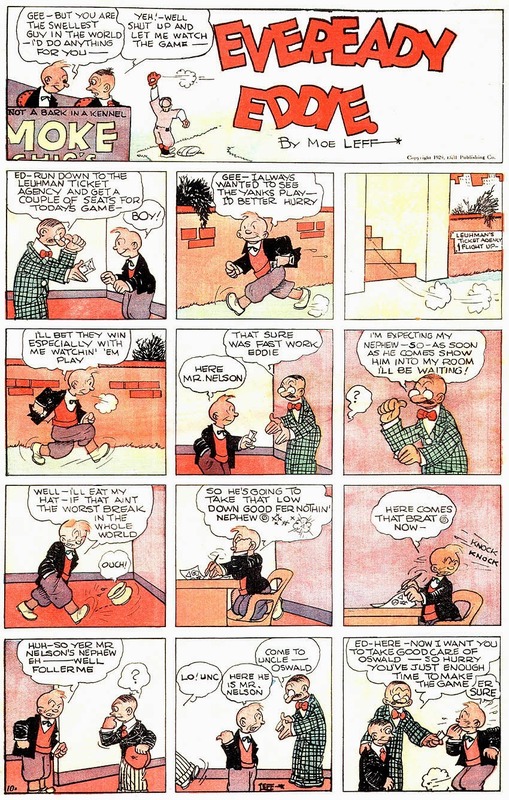 The Sunday-only strip began on June 3 1934 and ended barely more than a year later, on July 28 1935. 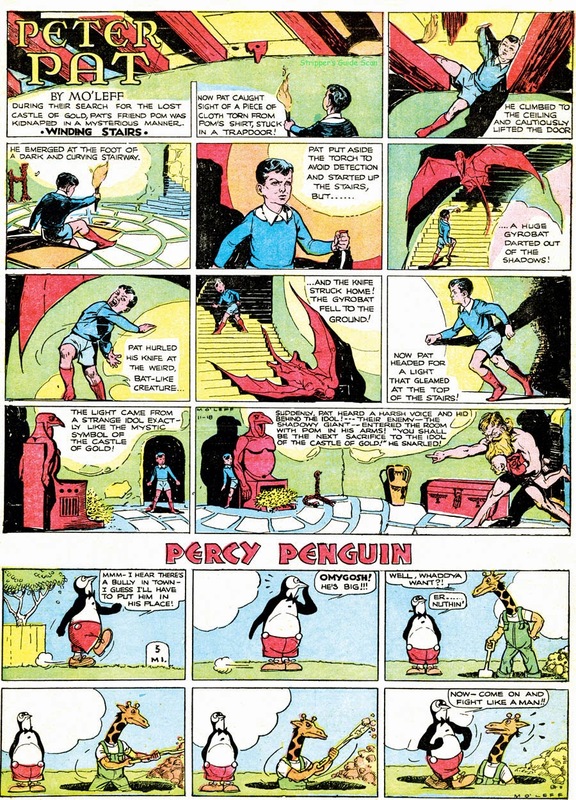 Some histories have mistakenly claimed that the strip ran until 1938, but those late appearances were from World Color Printing, which distributed the strip in reprints. Mo Leff went on to a distinguished career assisting on Li'l Abner, then taking over Joe Jinks for a time from Pete Llanuza, and finally helming Joe Palooka for about twenty years, uncredited on that strip until the last few years.